Drone intrusions at correctional facilities are a persistent, ongoing threat that will only escalate with time as inmates continue to test the boundaries of vulnerable airspace and a facility’s lack of knowledge of drone activity. Without this awareness, the consequences of drone intrusions at a correctional facility can cause disruption to the care and order of inmates, staff, and the general public. Drone deliveries can not only increase the risk of violence between inmates but threaten the physical safety of the facility and the people protecting it. Undetected drones can also expose security vulnerabilities by showing a bird's eye view of staff rotations and inmate movement. No correctional facility is immune to drone breaches. Contraband drops and other intrusions may remain undetected by security staff, placing prison staff, inmates and the public at risk. Below are several documented incidents of drone intrusions, and the impact of the crimes committed. One of the first publicly documented drone incidents occurred in 2015 when the Ohio Department of Rehabilitation and Corrections reported a yard fight broke out between 75 inmates after a drone dropped off a package in the yard. 144.5 grams of tobacco, 65.4 grams of marijuana and 6.6 grams of heroin were dropped from the air. A fight ensued and the package was thrown out of sight into the prison's south yard. Officers had to use pepper spray to get the situation under control, and inmates were later strip-searched before being allowed to return to their cells. After testing out drone deliveries, inmates were able to acquire more creative tools to support not only their drug habits but also test out the physical security of the facility. In 2017, South Carolina Department of Corrections reported a drone-assisted prison break. A prisoner broke out of a maximum-security prison using a cell phone to coordinate his movement, a makeshift dummy to throw off patrol officers, and a critical tool delivered via drone - wirecutters. After breaking through fences, the fugitive triggered a manhunt. Law enforcement apprehended him, and he was captured with a semi-automatic pistol, a pump shotgun, $47,654 in cash and four cell phones. Drones are also able to track movement and help organized criminals plan sophisticated attacks against correctional facilities. Drones were found buzzing ahead a French correctional facility months before a daring prisoner evacuation. Heavily armed men landed a helicopter in a prison courtyard, used a grinding machine to break open the door of the visiting room where a high-profile inmate was seeing his brother and escorted the prisoner to freedom. Not all contraband deliveries make it to the right destination, putting communities at risk for violence and unwanted activity. In Canada, a drone carrying marijuana, tobacco, cell phones, SIM cards, lighters, and glue, crash-landed on the roof of an elementary school. Investigators believe the drone was planning to fly to a correctional facility nearly a mile away, and instead ditched the contraband or lost control of the drone. With more time to practice comes more sophistication in drone contraband deliveries, but the law is catching up. In 2017, law enforcement in the UK prosecuted the players in a carefully orchestrated operation, which involved a drone “gang,” which connected criminals on the outside with contacts inside prisons, delivering contraband worth up to $1.34 million. Investigators had evidence of at least 49 illegal drone flights, with some using fishing lines and hooks to fly the contraband near cell windows. Inmates used tools such as a broom handle to grab the deliveries from the drones as they hovered outside. State and federal correctional facilities are gearing up with drone detection services and have found not only how much drone activity was happening in their airspace, but who was responsible. Proactive drone detection is used as a diagnostic tool, building intelligence around the scope and problem by auditing airspace, and then translating that information into strategic security protocol changes. At correctional facilities, drone detection hardware and software can be incorporated into an existing security ecosystem. Detection systems follow the drone’s flightpath and locate the pilot. Security personnel can use flight data to determine if a single drone has visited the area multiple times or if there are multiple, individual intruders, and record if there are certain days or times where there are an increase in incidents. This data is invaluable when looking to identify and prosecute pilots who violate federal laws. 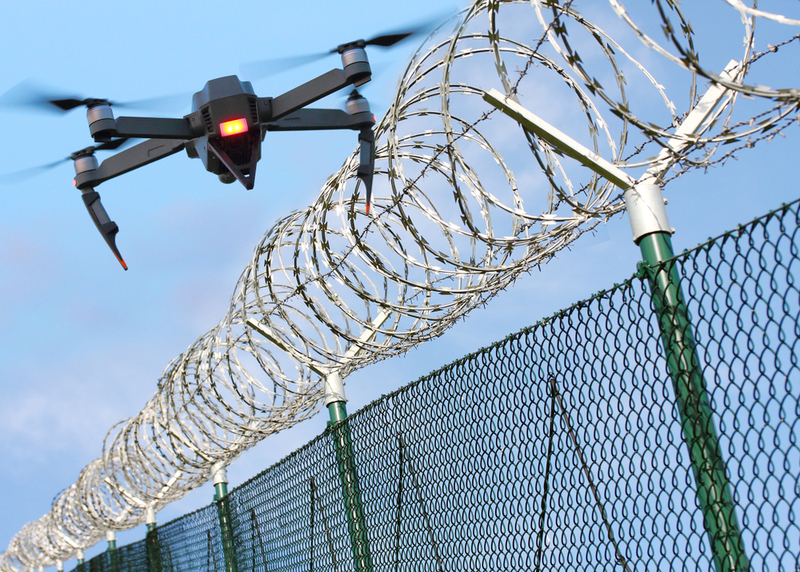 With drone detection technology, correctional facilities now have the upper hand in protecting their airspace from unwanted drones and dangerous contraband deliveries. See how drone detection systems work in this video with Georgia Department of Corrections. Want to learn more about how you can protect correctional facilities from drone threats? Read about the solution here.